Western blot analysis of extracts from HeLa, HeLa AAK1 Knockout (-/-), and HeLa AAK1 siRNA-transfected cells using AAK1 Antibody. Immunoprecipitation of AAK1 from HeLa cell extracts. 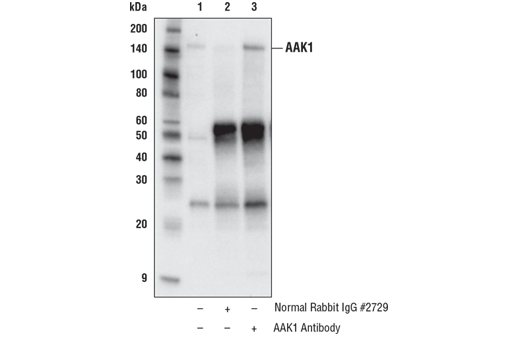 Lane 1 is 10% input, lane 2 is Normal Rabbit IgG #2729, and lane 3 is AAK1 Antibody. 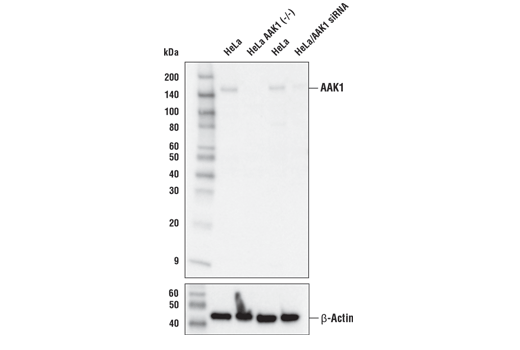 Western blot analysis was performed using AAK1 Antibody. AAK1 Antibody recognizes endogenous levels of total AAK1 protein. Polyclonal antibodies are produced by immunizing animals with a synthetic peptide corresponding to residues surrounding Ser7 of human AAK1 protein. Antibodies are purified by protein A and peptide affinity chromatography. Adaptor associated kinase 1 (AAK1) is a member of the Ark1/Prk1 family of serine/threonine kinases (1). AAK1 is enriched in synaptosomal preparations and modulates clathrin-dependent endocytosis, a process that is important in synaptic vesicle recycling and receptor-mediated endocytosis. AAK1, together with clathrin, and clathrin-adaptor protein, AP-2, forms a signaling complex at the cell membrane. AAK1-dependent phosphorylation of the mu-2 subunit of AP-2 enhances efficiency of endocytosis (2, 3). AAK1 is known to promote neurogulin/ErbB4 internalization to regulate neurotrophic signaling. Inhibition of AAK1 activity promotes cell surface expression of neuregulin/Erb4, cell-bound neurotrophic factors that is implicated in brain development and synaptic plasticity (4). Conner, S.D. and Schmid, S.L. (2002) J Cell Biol 156, 921-9. Flett, A. et al. (2005) Biochem Soc Symp , 65-70. Ricotta, D. et al. (2002) J Cell Biol 156, 791-5. Kuai, L. et al. (2011) Chem Biol 18, 891-906.